High-end antique collection housed in a centuries-old church. A roadside shrine to a late rock god only remains thanks to the unyielding efforts of his fans. With such a concentrated collection of luxury shops, Lord Cavendish saw a need to protect them from the criminal elements of London society, and with the Metropolitan police force still a decade away he created his own. Called the Burlington Arcade Beadles they are the world’s oldest and smallest private police force. Incredibly, they are still in existence today. Drawn from retired members of his former army regiment, the 10th Royal Hussars, the original Beadles were veterans of the Battle of Waterloo. Dressed today as they were in 1819, the Beadles still patrol the Burlington Arcade in traditional top hats and Victorian frock coats designed by Henry Poole of Saville Row. Lord Cavendish owned the Burlington House next door, and ordered architect Samuel Ware to cover the roof of the arcade to stop ruffians from throwing oyster shells over the wall and into his garden. From such humble beginnings the modern day shopping mall began. At nearly 100 yards long with a glass ceiling, the two story arcade was home to 47 tenants. Of these, at least six were recorded as being “industrious females.” Today the beautiful glass covered shopping street is still home to some of the most exclusive shops in London. Art dealers, high-end watches, jewelers, and dealers in antique silver. Hancock’s, occupiers of number 52, designed and created the original Victoria Cross, the United Kingdom’s highest decoration for valor and bravery, “in the face of the enemy.” All 1,358 VC’s ever awarded have been made by the prestigious tenant of the Burlington Arcade. 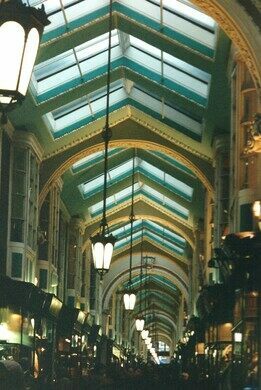 Today the Burlington Arcade remains as exclusive as it was in Victorian times. The industrious females may be long gone from the upstairs rooms, but the street-long collection of high-end luxury shops still do a thriving business, and are still protected by their own private police force, just as they were nearly 200 years ago.